You won't lose your ID or keys on this colourful lanyard and keyring set. Bright and bold to suit your personality. A little slice of paradise - MARUA LAGOON OR MARUA SHIMMER! Shimmer has a sparkle bead at top. 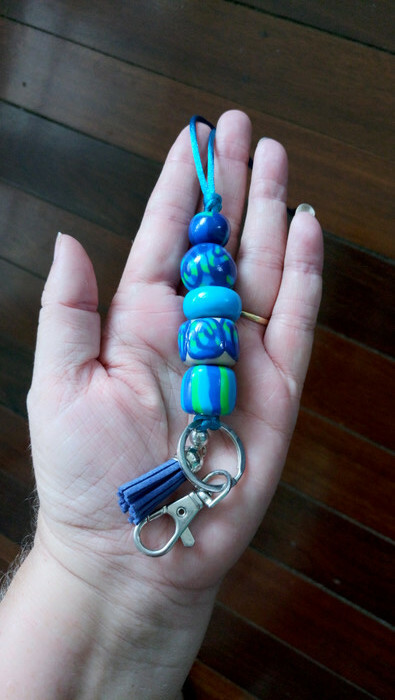 My polymer clay beads are all handmade ... this means pieces of coloured clays are blended, layered shaped or manipulated to give the patterns that you see. Beads included in these designs are: marble, overlay, stipe, plain or shimmer.. It is fitted with a silver, plastic capped, royal-blue tassel, peacock-blue soft silky nylon cord and silver metal lobster clasp and jump-ring, and a black plastic breakaway safety clasp. The clays I use are non-toxic. Each bead has been sealed with crystal clear gloss varnish to protect them from grime and dirt, prolonging the life of the lanyard, with an intensity in colours an added bonus. PLEASE CHOOSE: LAGOON or SHIMMER and message with choice at checkout. 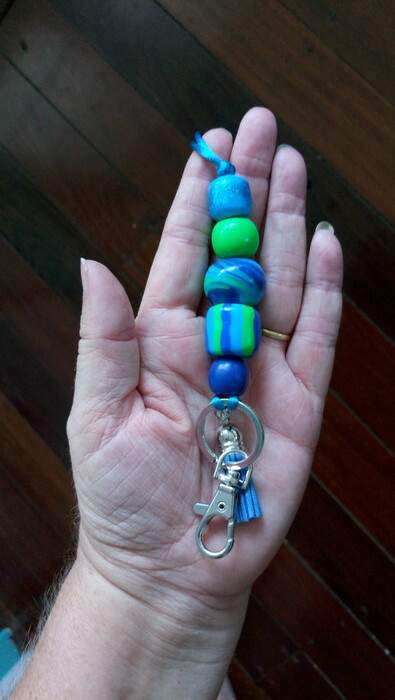 I have included a photo of the lanyard in my hand to give you an idea of size. I am 176cm tall, so my fingers are quite long. Postage is standard Australia Post, small parcels . If you would like signature delivery you can select this option from the shipping options during checkout. Sending my polymer clay beads by mail requires parcel delivery and not letter service as my beads are too big to fit through the slot in your letter box. Cost for parcels under 500g is $8.55. Combined shipping for up to 5 items (sets count as 2 items). This item is also listed else where so if you are not the first to buy it I will fully refund your purchase. I do my best to remove items sold else where as quickly as possible but there may be a cross over at some time which I will fully refund full amount and I apologise in advance for any inconvenience. Please use your madeit account name as reference.